Colombia, or formally, the Republic of Colombia (Spanish: República de Colombia , IPA [re'puβ̞lika ð̞e ko'lombja]), is the northwesternmost country of South America. Colombia is bordered to the east by Venezuela and Brazil, to the south by Ecuador and Peru, to the North by the Atlantic Ocean, through the Caribbean Sea, and to the west by Panama and the Pacific Ocean. Colombia is a large and physically diverse nation. It is the fourth-largest country in South America (after Brazil, Argentina, and Peru), with an area seven times greater than that of New England and more than twice that of France. Its vast territory is one of great physical contrasts, ranging from the towering, snowcapped peaks of the Andes to the hot, humid plains of the Amazon River Basin. Not only is Colombia large in area, but it also has a large population, containing more people than any other South American country except Brazil. The nation's population is not evenly distributed. Most of the people live in the mountainous western third of the country, where Bogotá, the capital, and most of Colombia's other large cities are located. Because this western region has a pleasant climate and rich soil, it is also where most agricultural activity takes place. Colombia currently suffers from a low intensity armed conflict involving rebel guerrilla groups, paramilitary militias, and drug trafficking, that started to develop since approximately 1964 or 1966, which was when the FARC and later the ELN were founded and subsequently started their guerrilla insurgency campaigns against successive Colombian government administrations. The current flag of Colombia is yellow, blue and red. The flag was first created in Haiti by Francisco Miranda, where Simon Bolivar was preparing to attain independence for Gran Colombia. The yellow represents the richness of the Colombian gold. The blue shows the two oceans which border North and West Colombia. The red represents the blood of soldiers of the people who fought and victoriously won the independence. The word "Colombia" comes from the name of Christopher Columbus (Cristóbal Colón in Spanish, Cristobal Colom in Catalan, Christophe Colomb in French, Cristoforo Colombo in Italian) and was conceived by the revolutionary Francisco de Miranda as a reference to the New World, especially to all American territories and colonies under Spanish and Portuguese rule. The name was then adopted by the Republic of Colombia of 1819 formed by the union of Venezuela, New Granada and Ecuador. In 1830, when Venezuela and Ecuador separated, the Cundinamarca region which remained became a new country, the Republic of New Granada. In 1863 New Granada changed its name officially to United States of Colombia, and in 1886 adopted its present day name: Republic of Colombia. Circa 10000 BC, hunter-gatherer societies existed near present-day Bogotá (at "El Abra" and "Tequendama") which traded with one another and with cultures living in the Magdalena River Valley. Beginning in the first millennium BC, groups of Amerindians developed the political system of " cacicazgos" with a pyramidal structure of power headed by caciques. Within Colombia, the two cultures with the most complex cacicazgo systems were the Tayronas on the Atlantic Coast, and the Muiscas in the highlands around Bogotá, both of which were of the Chibcha language family. The Muisca people are considered to have had one of the most developed political systems in South America, after the Incas. Spanish explorers made the first exploration of the Caribbean littoral in 1500 led by Rodrigo de Bastidas. Christopher Columbus navigated near the Caribbean in 1502. In 1508 Vasco Nuñez de Balboa started the conquest of the territory through the region of Urabá. In 1513, he was also the first European to discover the Pacific Ocean which he called Mar del Sur (or "Sea of the South") and which in fact would bring the Spaniards to Peru and Chile. In 1525, the first European city in the American Continent was founded, Santa María la Antigua del Darién in what is today the Chocó Department. The territory's main population was made up of hundreds of tribes of the Chibchan and "Karib", currently known as the Caribbean people, whom the Spaniards conquered through warfare, while resulting disease, exploitation, and the conquest itself caused a tremendous demographic reduction among the indigenous. In the 16th century, Europeans began to bring slaves from Africa. Since the beginning of the periods of Conquest and Colonization, there were several rebel movements under Spanish rule, most of them either being crushed or remaining too weak to change the overall situation. The last one, which sought outright independence from Spain, sprang up around 1810, following the independence of St. Domingue in 1804 (today known as Haiti), who provided a non-negligible degree of support to the eventual leaders of this rebellion: Simón Bolívar and Francisco de Paula Santander. Simon Bolivar had become the first president of Colombia/ Fransisco de Paula Santander was vice president, and when Simon Bolivar stepped down, Santander became the second president of Colombia. The rebellion finally succeeded in 1819, when the territory of the Viceroyalty of New Granada became the Republic of Great Colombia, as a Confederation with Ecuador and Venezuela. Modern day Panama, which subsequently remained a Colombian department until 1903, when it became independent, was also included in this union. Internal political and territorial divisions led to the secession of Venezuela and Quito (today's Ecuador) in 1830. At this time, the so-called "Department of Cundinamarca" adopted then the name " Nueva Granada", which it kept until 1856 when it became the "Confederación Granadina" (Grenadine Confederation). In 1863 the "United States of Colombia" was created, lasting until 1886, when the country finally became known as the Republic of Colombia. Internal divisions remained, occasionally igniting very bloody civil wars and, eventually, contributing to setting the stage for the U.S.-sponsored secession of Panama in 1903. Soon after, the country achieved a relative degree of political stability, which was interrupted by a bloody conflict which took place between the late 1940s and the early 1950s, known as La Violencia ("The Violence"). Its cause was mainly due to mounting tensions between partisan groups, reignited by the murder of Jorge Eliécer Gaitán in April 9th of 1948 an event later known as the Bogotazo, and it claimed the lives of at least 180,000 Colombians. To replace the previous 1886 document, a new constitution was made in 1991, after being drafted by the Constituent Assembly of Colombia. The constitution included key provisions on political, ethnic, human and gender rights, which have been gradually put in practice, though uneven developments, surrounding controversies, and setbacks have persisted. In recent decades the country has been plagued by the effects of the influential drug trade and by guerrilla insurgents such as the Fuerzas Armadas Revolucionarias de Colombia (Revolutionary Armed Forces of Colombia), or FARC, and illegal counter-insurgency paramilitary groups such as the Autodefensas Unidas de Colombia (United Self-Defense Forces of Colombia), or AUC, which along with other minor factions have been engaged in a bloody internal armed conflict. The powerful drug cartels have helped the Colombian balance of trade by creating a steady and substantial influx of foreign currency, mainly U. S. dollars. On the other hand, the druglords have destabilized the government and, in the 1980s, the neighbour country of Panama was invaded by the United States in 1989 to remove strongman General Manuel Noriega because of his alleged links to the drug trade. The different insurgent irregular groups often resort to kidnapping and drug smuggling to fund their causes, tend to operate in large areas of the remote rural countryside and can sometimes disrupt communications and travel between different regions. Since the early 1980s, attempts at reaching a negotiated settlement between the government and the different rebel groups have been made, either failing or achieving only the partial demobilization of some of the parties involved. One of the last such attempts was made during the administration of President Andrés Pastrana Arango, which negotiated with the FARC between 1998 and 2002. In the late 1990s, President Andrés Pastrana implemented an initiative named Plan Colombia, with the dual goal of ending the armed conflict and promoting a strong anti-narcotic strategy. The most controversial element of the Plan, which also included a smaller number of funds for institutional and alternative development, was considered to be its anti-narcotic strategy, consisting on an increase in aerial fumigations to eradicate coca. This activity came under fire from several sectors, which claimed that fumigation also damages legal crops and has adverse health effects upon population exposed to the herbicides. Critics of the initiative also claim that the plan represents a military approach to problems that have additional roots in the social inequalities of the country. During the presidency of Alvaro Uribe, who was elected on the promise to apply military pressure on the FARC and other criminal groups, some security indicators have improved, showing a decrease in reported kidnappings (from 3700 in the year 2000 to 1441 in 2004) and a decrease of more than 48% in homicides between July 2002 and May 2005. It is argued that these improvements have favored economic growth. Analysts and critics inside Colombia agree that there has been a degree of practical improvement in several of the mentioned fields, but the exact reasons for the figures themselves have sometimes been disputed, as well as their specific accuracy. Some opposition sectors have criticized the government's security strategy, claiming that it is not enough to solve Colombia's complex problems and that it has contributed to creating a favorable environment for the continuation of some human rights abuses. Colombia is also the first nation in the Americas and the second in the world to develop its own airline. The national airline of Colombia is Avianca. After Avianca, AeroRepública was introduced. Colombia has one festival for everyday of the year. During the most famous festivals (such as the Cali Fair, The Barranquilla Carnival, The Iberoamerican Theatre Festival and The Flower Festival) is when the most tourists come to Colombia. Many people also come into Colombia during Christmas time and the Independence of Colombia. It is interesting to note that even though Colombia has unfortunately been plagued with travel warnings because of FARC and other guerillas groups, it has surprisingly continued to attract more tourists in recent years. The apparent cause appears to be the current hardline approach of President Alvaro Uribe to push rebels groups farther away from the major cities and other tourist sites that may attract international visitors. Since President Uribe took office in 2002, he has notably increased Colombia's stability and security by significantly boosting its military strength and police presence throughout the country. This apparently has achieved fruitful results for the country's economy. 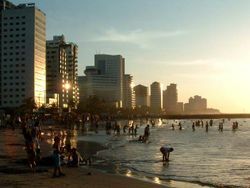 The World Tourism Organization reported in 2004 that Colombia achieved the 3rd highest percentage increase of tourist arrivals in South America between 2000 and 2004. (9.2%) Only Peru and Suriname had higher increases during the same period. Colombia has more physical diversity packed into its borders than any other area of comparable size in Latin America. The country is part of the Pacific "Ring of Fire", a region of the world characterized by frequent earthquakes and volcanic eruptions. Colombian surface features form complicated patterns. The western third of the country is the most complex. Starting at the shore of the Pacific Ocean in the west and moving eastward at a latitude of 5 degrees north, a diverse sequence of features is encountered. In the extreme west are the very narrow and discontinuous Pacific coastal lowlands, which are backed by the Serranía de Baudó, the lowest and narrowest of Colombia's mountain ranges. Next is the broad region of the Río Atrato/Río San Juan lowland, which has been proposed as a possible alternate to the Panama Canal as a human-made route between the Atlantic and the Pacific oceans. The chief western mountain range, the Cordillera Occidental, is a moderately high range with peaks reaching up to about 13,000 ft. (4,000 m.). The Cauca River Valley, an important agricultural region with several large cities on its borders, separates the Cordillera Occidental from the massive Cordillera Central. Several snow-clad volcanoes in the Cordillera Central have summits that rise above 18,000 ft. (5,500 m.). The valley of the slow-flowing and muddy Magdalena River, a major transportation artery, separates the Cordillera Central from the main eastern range, the Cordillera Oriental. The peaks of the Cordillera Oriental are moderately high. This range differs from Colombia's other mountain ranges in that it contains several large basins. In the east, the sparsely populated, flat to gently rolling eastern lowlands called llanos cover almost 60 percent of the country's total land area. This cross section of the republic does not include two of Colombia's regions: the Caribbean coastal lowlands and the Sierra Nevada de Santa Marta, both in the northern part of the country. The lowlands in the west are mostly swampy; the reed-filled marshes of the area are called ciénagas by the people of Colombia. The Guajira Peninsula in the east is semiarid. The Sierra Nevada is a spectacular triangular snowcapped block of rock that towers over the eastern part of this lowland. Colombia's proximity to the equator influences its climates. The lowland areas are continuously hot. Altitude affects temperature greatly. Temperatures decrease about 3.5° F. (2° C.) for every 1,000-ft. (300-m.) increase in altitude above sea level. Rainfall varies by location in Colombia, tending to increase as one travels southward. This is especially true in the eastern lowlands. For example, rainfall in parts of the Guajira Peninsula seldom exceeds 30 in. (75 cm.) per year. Colombia's rainy southeast, however, is often drenched by more than 200 in. 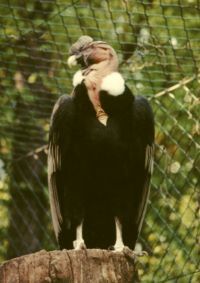 (500 cm.) of rain per year. Rainfall in most of the rest of the country runs between these two extremes. Altitude affects not only temperature, but also vegetation. In fact, altitude is one of the most important influences on vegetation patterns in Colombia. The mountainous parts of the country can be divided into several vegetation zones according to altitude, although the altitude limits of each zone may vary somewhat depending on the latitude. The tierra caliente (hot land), below 3,300 ft. (1,000 m.), is the zone of tropical crops such as bananas. The tierra templada (temperate land), extending from an altitude of 3,300 to 6,600 ft. (1,000 to 2,000 m.), is the zone of coffee and maize. Wheat and potatoes dominate in the tierra fría (cold land), at altitudes from 6,600 to 10,500 ft. (2,000 to 3,200 m.). In the so-called zona forestada (forested zone), located between 10,500 and 12,800 ft. (3,200 and 3,900 m.), many of the trees have been cut for firewood. Treeless pastures dominate the páramos, or alpine grasslands, at altitudes of 12,800 to 15,100 ft. (3,900 to 4,600 m.). Above 15,100 ft. (4,600 m.), where temperatures are below freezing, is the tierra helada, a zone of permanent snow and ice. Vegetation also responds to rainfall patterns. A scrub woodland of scattered trees and bushes dominates the semiarid northeast. To the south, savanna (tropical grassland) vegetation covers the Colombian portion of the llanos. The rainy areas in the southeast are blanketed by tropical rain forest. In the mountains, the spotty patterns of precipitation in alpine areas complicate vegetation patterns. The rainy side of a mountain may be lush and green, while the other side, in the rain shadow, may be parched. Large tracts of land are used for coca plant cultivation. In 2004, 114,100 hectares of land were used to grow the plant, and the nation has a producing potential of 430 metric tons of cocaine every year. Coca cultivation is a major business in Colombia, and even government owned land is not off-limits for the ambitious cartels. Executive Branch: Colombia is a republic where the executive branch dominates government structure. Up until recently, the president was elected together with the vice-president by popular vote for a single four-year term, which functioned as both head of government and head of state. However, on October 19, 2005, the Colombian Congress amended the constitution, which now allows Colombian presidents to serve up to two consecutive four-year terms. However department governors, mayors of cities and towns and other executive branch officials are only elected for a three year term, and cannot be immediately reelected. 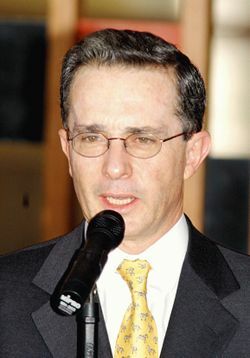 On May 28, 2006, president Álvaro Uribe Vélez was reelected by a vote of 62%, against 22% for Carlos Gaviria Díaz of the Democratic Pole, and 12% for Horacio Serpa Uribe of the Liberal Party. Legislative branch: Colombia's bicameral parliament is the Congress of Colombia or Congreso, which consists of the 166-seat House of Representatives of Colombia and the 102-seat Senate of Colombia. Members of both houses are elected by popular vote to serve four-year terms. Colombia is also a member of the South American Community of Nations. With congressmen, Colombia also elects Department deputies, and city councils. Judicial Branch: In the 1990s, the Colombian judicial system underwent significant reforms and is undergoing a process of migration from an inquisitorial system to an adversarial system. Parts of the coffee growing region of Colombia and Bogotá have already adopted the adversarial system, with the rest of the country following suit starting on January 1, 2006. The judicial system is headed by a Supreme Justice Court and members are appointed by the president and congress. Colombia is divided into 32 departments and one capital district. Statistics reveal that Colombians are predominantly Roman Catholic and overwhelmingly speakers of Spanish, and that a majority of them are mestizos (of mixed European and Native Amerindian descent). About 25 percent of the people are of pure European descent, while another 12 percent are black or of mixed African and European heritage. The ancestors of the black population were brought to Colombia to work as slaves on tropical-lowland plantations during the colonial period. They have contributed much to Colombia's cultural heritage. Some 3 percent of the people are of mixed black and Indian descent. Pure Native Amerindians comprise 5 percent of the population. More than two-thirds of all Colombians live in urban areas—a figure significantly higher than the world average. The literacy rate (88 percent) in Colombia is also well above the world average, and the rate of population growth is slightly higher than the world average. Also, a large proportion of Colombians are young, largely because of recent decreases in the infant mortality rate. While 33 percent of the people are 14 years of age or younger, just 4 percent are aged 65 or older. After experiencing decades of steady growth (average GDP growth exceeded 4% in the 1970-1998 period), Colombia experienced a recession in 1999 (the first full year of negative growth since 1929), and the recovery from that recession was long and painful. Colombia's economy suffers from weak domestic and foreign demand, austere government budgets, and serious internal armed conflicts. 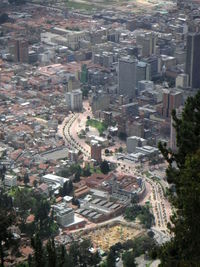 The IMF Economic Indicators published on September 2006, forecast the Colombian GDP to reach US$149.869 billion in 2007. Inflation has been below 6% for 2004 and 2005, and is expected to remain below 5% during 2006. Colombia's main exports include manufactured goods (41.32% of exports), petroleum (28.28%), coal (13.17%), and coffee (6.25%). Colombia is also the largest exporter of plantains to the United States. All imports, exports, and the general trade balance are in record levels, and the inflow of export dollars has resulted in substantial revaluation of the Colombian Peso. The problems facing the country range from pension system problems to drug dealing to high unemployment. Several international financial institutions have praised the economic reforms introduced by current President Alvaro Uribe, which include measures designed to bring the public-sector deficit below 2.5% of gross domestic product (GDP). The government's economic policy and its controversial democratic security strategy have engendered a growing sense of confidence in the economy, and GDP growth in 2003 was among the highest in Latin America. With approximately 43.6 million people in 2006 , Colombia is the third-most populous country in Latin America, after Brazil and Mexico. Movement from rural to urban areas was very heavy in the middle of the 20th century, but has since tapered off. The urban population increased from 31% of the total population in 1938, to 57% in 1951 and about 70% by 1990. Currently the figure is about 77%. Thirty cities have a population of 100,000 or more. The nine eastern lowlands departments, constituting about 54% of Colombia's area, have less than 3% of the population and a density of less than one person per square kilometer (two persons per sq. mi.). Colombia's total population in 2015 is projected to be more than 52 million. The country has a diverse population that reflects its colourful history and the peoples that have populated here from ancient times to the present. The historic amalgam of the different main groups are the basics of Colombia's current demographics: European immigrants, Indigenous Natives, African slaves, Asians, Middle Easterners and Others Recent immigrants. Many of the indigenous peoples were absorbed into the mestizo population, but the remaining 700,000 currently represent over 85 distinct cultures. The European immigrants were primarily Spanish colonists, but a small number of other Europeans (Dutch, German, French, Swiss, Belgian and in smaller numbers Polish, Lithuanian, English and Croatian communities) immigrated during the Second World War and the Cold War. For example, former Bogota mayor Antanas Mockus is the son of Lithuanian immigrants. The Africans were brought as slaves, mostly to the coastal lowlands, beginning early in the 16th century, and continuing into the 19th century. After abolition, a national ideology of mestizaje encouraged the mixing of the indigenous, European and Native Amerindian communities into a single mestizo ethnic identity . Other immigrant populations include Asians and Middle Easterners, particularly Lebanese, Jordanians, Syrians, Chinese, Japanese and Koreans. Ninety-six percent of the population practices Roman Catholicism. Another four percent is divided mainly amongst the Protestant, Mormon, Jewish and Muslim religions. Thirteen percent of the population declares itself to be non-religious. One percent of Colombians practice indigenous religions. Colombia has a network of national highways maintained by the Instituto Nacional de Vías or INVIAS (National Institute of Roadways) government agency. The Pan-American Highway travels through Colombia, connecting the country with Venezuela to the east and Ecuador to the south.